When it comes to the proper application of epoxy coatings, like chess, the rules are easy — but mastering it is difficult. Proper product selection, proper surface preparation, proper mixing, proper applying and proper curing sound simple enough, but are relatively difficult to execute. What happens if not applied correctly? Lab and field tests have shown cavitation performance superior to stainless steel, and much better than carbon steel and cast iron. What less experienced individuals sometimes fail to understand is that substrate surface preparation is essential to assuring the coating will exhibit the required long-term adhesion under cavitating conditions. 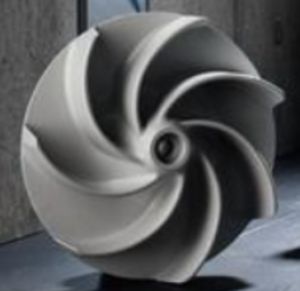 For instance, when a centrifugal pump experiences premature damaging cavitation, and the Net Positive Suction Head Available (NPSHA) cannot be significantly increased, options include more cavitation-resistant impeller materials, and various metal and polymer coatings. The most cost-effective/cavitation-resistant coatings tend to fall in the unreinforced polyurethane, elastomer family. Polymer coatings can also slightly increase overall pump efficiency. If you’re too busy or simply need an experienced helping hand, then contact C&B Equipment. Our team has the skills and the resources to ensure your equipment does not fall victim to premature cavitation and maintains its longevity throughout years of heavy use. That’s what we at C&B call Uptime Solutioneering™.